How to run environmental fate studies on industrial chemicals the right way! Environmental fate studies are well established for crop protection chemicals and pharmaceuticals and are becoming commonplace for industrial chemicals, but what are the key considerations for setting up and running them? As part of testing under Registration, Evaluation, Authorisation and Restriction of Chemicals (REACH) regulations, the European Chemicals Agency (ECHA) commonly asks chemical manufacturers and importers to conduct environmental fate studies, operating under Organization for Economic Co-operation and Development (OECD) guidelines 307, 308 and 309. 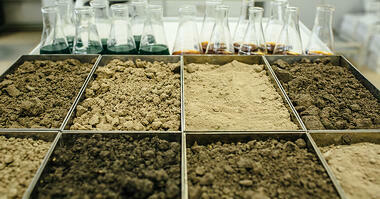 These studies test the fate of a chemical in soil, aquatic sediment systems and surface water. In addition, identification of degradation products is also frequently required. So, what do you need to consider when planning these environmental fate studies? To start, it is vital to know the structure of the test substance and have good insight into its physical and chemical properties, including its solubility and potential volatility. These characteristics influence study design and analytical approaches. The best study designs will utilize a radiolabeled form of the test substance to enable traceability. The most commonly used radiolabel is carbon-14 (14C). The location of the radiolabel in the molecule is important as this determines whether the major degradation pathway can be followed. For substances of unknown or variable composition, complex reaction products or biological materials (UVCB substances), the method of radiolabeling needs careful consideration and you may wish to consult the regulatory authority to agree on the best approach. In order to assess any degradation, it is necessary to start with a pure test substance; we aim for radiochemical purities of more than 95%. Analytical methods should be sufficiently robust to separate many degradates from the test substance in a variety of media. The structure of the test substance can help to develop methods and predict possible degradation products. While high-performance liquid chromatography (HPLC) with radiodetectors is the routine method for separation and quantification of test substance and degradates, mass spectroscopy can provide qualitative structural information. Where test substance levels are at the lower end of a system’s detection limit, off-line quantification is utilized to enhance detectability. It can be time-efficient and cost-effective to run short, downsized, non-regulated studies to assess how a test substance will behave in a test system. These preliminary results can help you refine the definitive study approach – for example, by modifying the incubation conditions, optimizing the sampling intervals or fine-tuning the analytics. If the modifications deviate significantly from the OECD guideline, then justify your choices and demonstrate the validity of the approach within the study report. Mass balance is fundamental to all environmental fate studies, as it means that the total mass of your substance (in terms of applied radioactivity) is accounted for across the different compartments in your test system: soil or sediment, water and air. The test substance’s solubility and volatility can complicate these measurements, so take these into account. Non-extractable residues (NERs) are materials bound to the solid fractions – soil or sediment – of test systems. You should demonstrate that as much as possible of any NER is extracted, but avoid treating your test system too harshly, because this would not represent the environment under normal conditions. Detection of significant (typically >10%) levels of the applied radioactivity as unknown degradates will trigger identification work with mass spectroscopic techniques such as liquid chromatography–tandem mass spectrometry (LC–MS/MS). Availability of non-radiolabeled reference standards of known or potential degradates is hugely valuable, allowing you to perform co-chromatography with the unknown degradate to confirm its identity. In an increasingly complex regulatory arena, environmental fate is a key part of your testing program. Envigo has over 30 years’ experience in this area, conducting both laboratory and field studies, including higher-tier testing. Our experts are on hand to help you design bespoke studies that address modern challenges. Here is some more information about Envigo's environmental fate services.